LATEST: Is Kurdish President Masoud Barzani Pursuing Independence? Week Past, Week Ahead: Syria — How Will the Iraq Crisis Re-Shape the Conflict? UPDATE 1600 GMT: US Secretary of State John Kerry said that, after their meeting on Monday, Iraqi Prime Minister Nuri al-Maliki has committed himself to forming a new Government. Kerry said Governmental representatives will meet on July. A Speaker of Parliament will be selected, then a President, then a Prime Minister. Iraq has been without a Parliament since April’s elections, when no party won a majority of seats and no ruling coalition was formed. The Secretary of State declared that, during this process, Washington’s support for Iraqi security forces will be “intense and sustained”. After meeting Maliki, Kerry saw the Sunni Speaker of Parliament Osama al-Nujaifi and Ammar al-Hakim, the leader of the Shia Islamic Supreme Council of Iraq. A local official and witnesses have confirmed that insurgents have finally taken Tal Afar airport, in northwestern Iraq near the Syrian border, after more than a week of attacks. 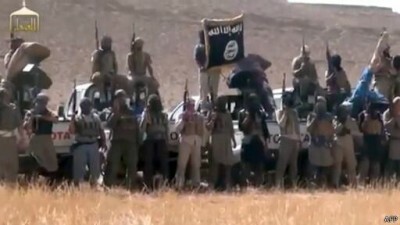 “The town of Tal Afar and the airport…are completely under the control of the militants,” the official said. Insurgents had claimed most of the town last week, but still faced some resistance from Iraqi forces. UPDATE 1140 GMT: Officials say 69 detainees have been slain in an insurgent attack as they were being moved south of Baghdad. A police captain and doctor said one policeman and eight insurgents were also killed near Hashimiyah in Babil Province. UPDATE 1100 GMT: US Secretary of State John Kerry arrived in Baghdad for talks with political leaders, including Prime Minister Nuri al-Maliki. The session with al-Maliki ended after 1 hour and 40 minutes. Insurgents continued their advance between the Syrian border and Baghdad on Sunday, taking more border crossings and towns. Opposition fighters moved into the Al-Walid crossing, following their victory at the Al-Qaim crossing on Saturday, and captured the towns of Rawa, Ana, Rutba, and Husaybah, 100 km (62 miles) from Baghdad. The insurgents also took the Turabil crossing on the Jordanian border. The advance extended insurgent gains from January in Anbar Province and confirmed a two-front move on the capital: from Anbar in the west and moving from Mosul through Tikrit and towards Samarra and Baquba from the north and northeast. Iraqi forces suffered significant losses over the weekend. In Al Qaim alone, at least 30 Iraqi troops and 70 Shia volunteers were killed. In other cases, Iraqi soldiers withdrew before clashes erupted. 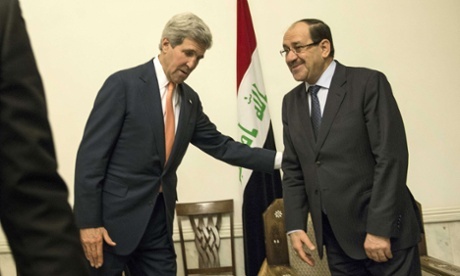 On the political front, both President Obama and US Secretary of State John Kerry called for a new unity government without saying directly that Prime Minister Nuri al-Maliki must step down. Is Kurdish President Masoud Barzani Pursuing Independence? Unfortunately, the experience (for a democratic Iraq) has not been successful….That’s way I believe, after the recent events in Iraq, it has been proven that the Kurdish people should seize the opportunity now to determine their future. Iraq Kurdish President Barzani says PM Maliki must go; says he ignored his warnings on ISIS. Amid the escalating crisis, Iraqi Kurdistan is seizing the opportunity to break Baghdad’s resistance to its oil exports. Turkish Energy Minister Taner Yıldız said a third tanker with Kurdish oil has left Turkey’s Mediterranean port of Ceyhan and a fourth tanker is being loaded. Yildiz said he did not know who is buying the oil; however, last week oil from Kurdistan’s new pipeline was delivered for the first time in Israel, at the port of Ashkelon. The Iraqi Government and Kurdistan have been locked in a lengthy dispute over shares of Iraq’s oil revenues. NextSyria Daily, June 23: Will a New Truce End Suffering in Yarmouk in Damascus?